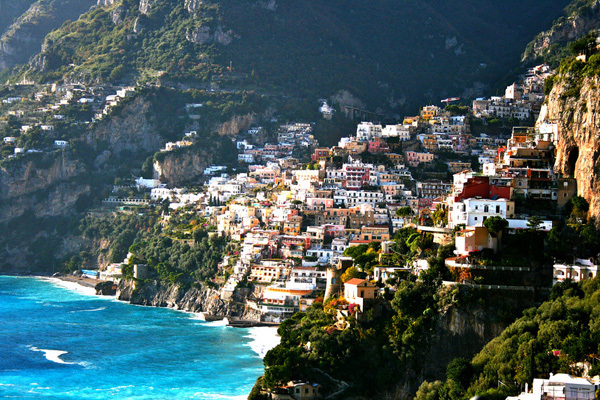 Amalfi is in Campania, Italy. Amalfi is the heart of this magnificent Italian coastline and a must-see town on your Amalfi Coast adventure. The SITA local bus network travels all over the Amalfi Coast. To and from Sorrento via Positano and Praiano and onwards to Furore Fjord, Conca and its Emerald Grotto. Buses also travel to and from Salerno from Amalfi via Minori, Minori, Cetara and Vietri. Local buses also link Amalfi to Ravello and the upper reaches of Furore, Pogerola, Agerola and Napoli. It is a comfortable way to travel along the Amalfi Coast and Sorrentine Peninsula on the bus, however if you are prone to motion sickness the hairpins on these roads will certainly induce symptoms very quickly! SITA offers a very efficient public transportation service in the area, with expert drivers who breeze along the winding roads like they were driving on a highway (you will be happy to know that they are experienced). Here is something that you might need to know to know before you board your bus. 1. You have to buy your tickets in advance, before you get on the bus. Tickets can be bought at caffe bars, some have a black and white sign ‘Tabacchi’ hanging out the front while some stores selling lotto tickets also sell bus tickets so look out for these too. Shops also which display the SITA logo as well as at the SITA ticket office at the Salerno train stations. If a bar does not sell SITA tickets, you can always ask where you can find them as they are generally helpful. Headquartered in Amalfi, ferries are operated by Coop Sant’Andrea (a consorzio which includes Travelmar, Alicost and Linee Marittime Partenopee). Coop Sant’Andrea run the ferry service from Salerno to Amalfi, Amalfi to Salerno, Amalfi to Positano, Positano to Amalfi, Positano to Salerno, Salerno to Positano and connections in summer between Amalfi-Minori-Maiori. Schedule 2009 online.Tickets can be purchased at the ticket booth located on the main pier in Amalfi called Molo Pennello or at Divina Costiera, an information point in Amalfi opposite the SITA bus terminal. Linee Maritime Salernitane (Ph: 089/873301 in Amalfi; 089/811164 in Postiano; 081/8073024 in Sorrento). Positano ferry and hydrofoil ticket office (Via del Brigantino, Italy. PHONE: 089/811986). The two main train stations serving the Amalfi Coast are Salerno which has direct Eurostar and inter-regional trains connections to Naples and Rome and the local Circumvesuviana over in Sorrento which is the main train line which connects Sorrento to Naples and importantly, Sorrento to Pompeii ruins. Conveniently, both stations are also hubs for cheap, efficient bus and ferry services radiating toward the major tourist destinations along the Amalfi Coast and inland. It is simple to hire a car for your stay – but driving in southern Italy is not for the faint-hearted! The Amalfi Coast roads are very narrow and cliff-hanging, and will either provide a challenging drive. But there are many spots to stop along the coastal roads and small towns that are only easily accessible if you have your own car. For those who are truly adventurous, scooters can be a practical form of transport, however precision driving is key. The ferry and bus services on the Amalfi Coast offer excellent connections between towns and the price of parking could also put you off hiring a car. Amalfi is 270 km from Rome, 70 km from Naples, 60 km from Avellino and 85 km from Caserta. The Cathedral was built in the 10th century. You can see its magnificent bell tower from the harbour. The Cloister of Paradise Next to the cathedral, was also built in the 13th century. It is home to old mosaics and paintings, and 120 columns built in the Arabic style. The beach can be crowded in summer, particularly in August when Italians are on holiday and let their kids loose for the month on the strip of pebbled beach. Evening walk along the marina to where the mega-yachts dock in summer time. The Amalfi Coast to Capri Boat Excursion is a full-day sightseeing tour taking in all the Amalfi Coast villages, including Ravello, Positano, Atrani, Praiano, Maiori and Minori. You visit the grottos in Capri and Amalfi, you can go swimming directly from the boat, the tour circumnavigates Capri island and you have the opportunity to disembark in Capri for three hours of your own time before you cruise back at about 6pm. Departures from Amalfi, Maiori and Minori. A half-day Amalfi to Positano Cruise is also offered by Amalfi Boat Excursion and is perfect for travellers with limited time. That’s Amore Cycling Excursion offer in every season exclusive guided and customized cycling exploration of the coast : short and easier route and a longer or more demanding route for the keener cyclists. Hiking in the Valle delle Ferriere from the Valle dei Mulini locality upwards through the Valle delle Ferriere and back to Chiorito locality.